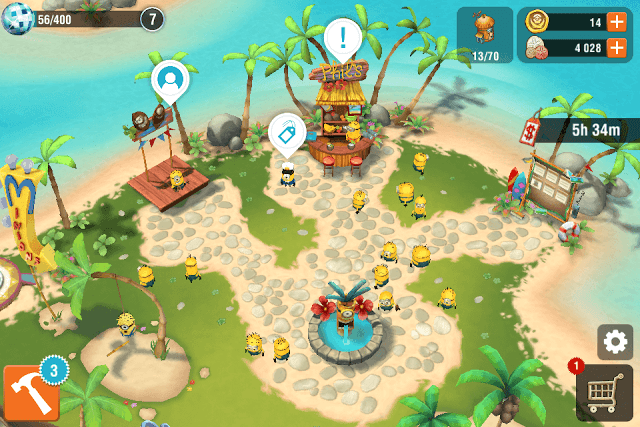 Minions Paradise is a fun little island builder from EA mobile. The game revolves around the misadventures of Phil and his attempts to redeem himself for his goof job. Help him build a paradise in an uninhabited island for his shipwrecked buddies and cheer them up with goodies and gadgets. 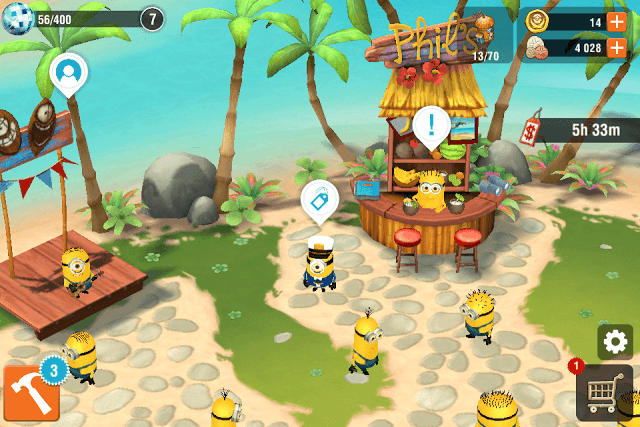 Minions Paradise features plenty of quests, fun mini-games and lots of crazy and cute monsters. You can craft items, harvest resources and sell them to other players via the live marketplace. If you want to help Phil turn a boring island into the most happening party land, follow these tips, hints and strategies. Before assigning any task to a minion, tap on the coconut tree or any other resource-generating structure. You will notice the total number of minions available. Now make a mental note of the total number and separate minions into tiny groups – one group for “Making Stuff” tasks, another group for “Mixing Stuff” tasks and the rest should be used to participate in “distractivities” to earn extra party points. Finally use any spare minion to play a mini game. Set your priorities straight. If Phil’s task is quite tough to complete, then use minions to complete party supplies tasks available in the “Celebration station”. While completing party supplies tasks, make sure distractivity structures aren’t empty. Assign spare minions to earn some free party points from distractivities while the others are busy crafting and making items. The more resources you make, the higher the chances of rare/clearing item drops. Keep generating resources and you may get more uncommon items. So keep assigning minions to “Make Stuff” tasks, and then you may complete party supplies or sell the resources via the Marketplace. 1. Go to the Marketplace and Tap on Sell. Next, tap on an item you want to sell. You will notice a Green Up arrow or a red down arrow beside the price. A green up arrow indicates the price of the selected item is on the rise and there is some demand. It’s up to you to sell them at a higher or lower price than the market price, although setting a higher price would be a better option. For items with a down red arrow, it shows the demand is decreasing. You may buy that item (if you need it) at dirt cheap price and later sell it at a higher price. 2. Tap on “Buy” to check what price other players have set for their items. You may then set your own price a bit lower than the market price. This way your item or multiple items of the same type may be sold faster. Make sure you connect to FB to unlock more item slots and then check what price a common, uncommon or rare item is being sold on the marketplace. 3. There is a higher demand for uncommon items – those items that randomly drop while harvesting resources. If you have an extra clearing item or a fish stick, then put it up on sale and make sure you sell it at a good price. 4. There is also a higher demand for items crafted at the Weapons Armory and the Rec Center. If you have a spare item or two, sell them immediately for some quick in-game cash. Connect to Facebook to unlock additional sell slots. 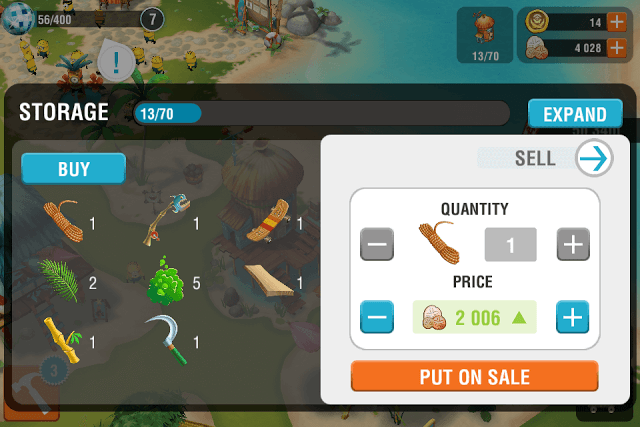 Once you have put an item on sale, you can remove it by spending doubloons, so choose your items wisely. 5. Common items sell faster, so keep on putting up extra items, the ones you don’t need, on sale and they will be sold within a few hours. Sell rare items to a buyer Minion. He has a price tag icon on top of him. This minion usually appears near the Tiki Lounge. Tap on him to see how much sand dollar he is willing to offer for rare or clearing items. Sell your stored items via Storage/Marketplace. Tap on the storage building and tap on “Sell”. You can set the price for an item and it will go live and appear on other player’s marketplace in the “Buy” section. Connect to Facebook if you want to sell different types of items. You will need doubloons to delete your sale, in case you don’t want to sell an item. Participate in “Social Events” (for example – Stuart’s Concert) to earn extra dollars and party points. Social events have a time limit and you, along with your Facebook friends must complete Team Orders before the timer runs out. You must set a “Team” of 4 or more FB friends who may participate in your event and earn rewards faster. The faster you complete team orders the more rewards you and your friends will receive. The celebration station also offers sand dollars in exchange for party supplies. Look for stickies that ask you to “Mix Stuff” to create a new item. Such stickies offer more sand dollars than those that let you gather resources aka “Make Stuff”. Playing mini-games also grants sand dollars – lots of them. You will need to reach a certain score target to get rewards like dollars, doubloons etc. Minions Paradise’s celebration station contains stickies that offer several “Make” and “Mix” tasks. Completing them will earn you sand dollars and party points. Tap on the celebration station and look for stickies that offer higher rewards. Most “Mix” tasks i.e. crafting tasks will fetch more dollars and party points. Also, tasks that unlock a minion’s story grant plenty of party points and dollars. Keep an eye on such tasks to get more rewards. If both Phil’s task and celebration station’s task are the same, complete the task and tap on Phil to finish it first and then “Fill Favors” for the same task in the celebration station. Filling favors first will remove items and Phil’s quest won’t be completed. You may have to start his task from scratch. You will get a “2X Speed boost” reward after earning a party. Once the meter fills up, Phil throws a party. Soon the islanders get into a party mood (you can skip the party cut-scene). The speed boost timer begins after the party gets over. With the speed boost timer on, quickly assign minions to craft or harvest those items that usually take too much time to complete. With the 2X speed boost, producing or crafting items will be much faster. Clearing and other rare items appear as random drops from production units. Keep assigning missions to produce common items to increase the chances of uncommon item drops. If you have too many common items in your storehouse, combine them to craft new items, fill party supplies or sell them via the marketplace. Party points (PPs) are like XP. You will need them to fill the Party Meter. Besides triggering a party atmosphere, the meter also grants some rewards and unlocks new structures once it fills up completely. You may get a doubloon and a power-up that reduces your building speed temporarily. Also, there’s at least one minion joining your ship-wrecked buddies once the party gets over. 1. “Distractivities” can earn you guaranteed party points. Assign minions to recreational stuff to earn party points. Distractivities can be found in the build menu (hammer icon). You will receive PPs once the timer for each “distractivity” reaches zero. Don’t forget to tap on the shiny disco ball beside each distractivity structure to collect them. 2. You will get Party Points via the Celebration Station, which is located beside the Tiki longue. The celebration station has all kinds of stickies. Party points vary as per the supply requirement. Easy to make supplies will give you fewer party points than tasks that require you to combine two or more materials. 3. Placing decorations also earns you some PP, but only once. You will have to place another decoration of the same type to earn party points again. Spend sand dollars to get one and earn instant PPs. You can also receive them by placing a new structure – could be structures that make stuff or those that mix stuff. The party points you will receive are actually building completion rewards. 4. 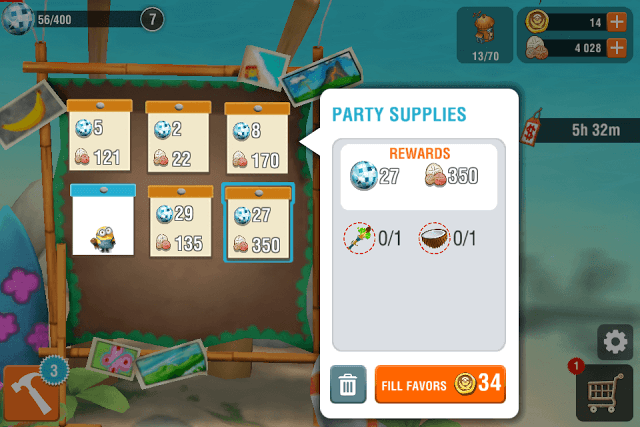 Keep playing mini-games such as Fishing Frenzy to get party points. Once you have finished playing, there will be a cool-down period which will last for a few seconds. You can play the mini-game again to earn some more PPs. Mini-games are fun to play and you will never get bored. Besides the guaranteed party points, there are also other rewards like doubloons and lots of sand dollars. 5. Complete Phil’s quests. Tap on the Tiki Longue and then on the quest icon above Phil to check available quests.